BLTN? What the heck is BLTN? Better Late Than Never. Does that sound good? I mean, this game has been out for a while (I am sure you said that to yourself as you read the title), so why are you doing a review? Well, because I really enjoyed the game a lot even though I was late to the party, so BLTN! After months of deliberation, I finally picked up Dragon Quest Heroes: The World Tree’s Woe and the Blight Below on the PS4. Dragon Quest Heroes was developed by Omega Force, a division of Koei Tecmo who are very well known for their Dynasty Warriors series. I’ve never played Dynasty Warriors. However, as a fan of the incredibly awesome Dragon Quest XIII, I thought this may be a great game to try out the Dynasty Warriors archetype. You know, to dip the toes into the ‘destroy onslaughts of enemies while looking like an absolute badass’ pool. I don’t personally own a Wii U, but if I did, I would have definitely played Hyrule Warriors being an avid Zelda fan. 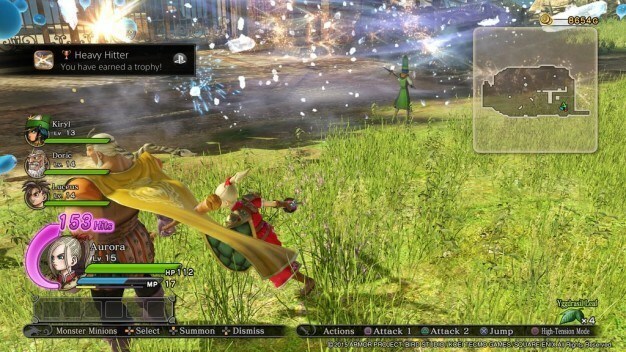 Dragon Quest Heroes is a tactical action game incorporates beat em up and hack n slash with an element of strategy (in case you weren’t familiar with the Dynasty Warriors format). The strategy is that you will be employed to protect a person or object and you will need to coordinate the battle as enemies come at you from all different directions. There is no top down tactical map where you assign troops/warriors to cover this area while you attack another. The strategy is real time where you can assign monsters that you have defeated to fight for you while you take on another front. My one screenshot that didn’t get lost on my PS4! How do you accomplish this then? The mechanic is that you get monster medals of your enemies that you can immediately use to aid you in battle. These include monsters that will simply fight for you or a monster that gives you a one-time buff. Using these medals smartly will get you ahead of your enemy and can quickly turn the tide of battle. So what’s the story here? Why are fighting hordes of monsters? Well, the Kingdom of Arba was a land where humans and monsters coexisted peacefully. However, the monsters suddenly turned against the humans by a mystical force and you must find out why in order to save this once harmonious relationship. You play as a member of the Royal Guard sworn to protect the King Doric, either Luceus or Aurora, that are always best friends. Whomever of these characters you decide to play will be your main character that will always be in the battle, while the other can be a part of your battle party. Three other characters will join you in each fight, and you will eventually assemble a range of characters that you can swap in and out of your party. 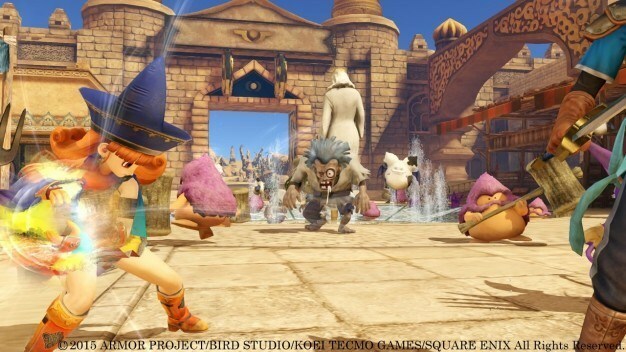 These warriors are all characters from previous Dragon Quest games, so fans of the series will be over the moon playing as some of their favorite characters. Yes, you can switch your characters during the battle. So you can take hold of Yangus and start swinging your giant mallet at baddies as soon as the battle starts. However, to take full advantage of the situations you are thrown into, you will want to switch between your warriors to exploit their strengths against the enemy or to aid your party in the heat of battle. 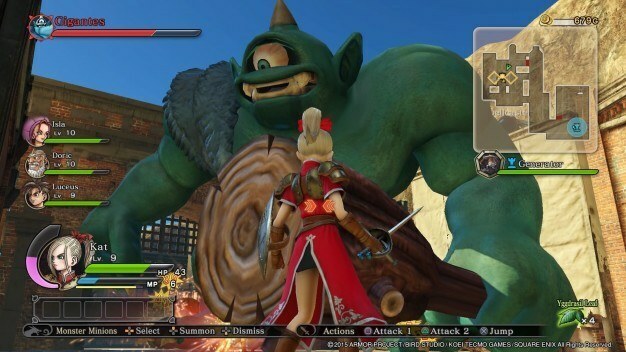 The graphical style of Dragon Quest Heroes is exquisite. The character models are born from the mind of artist Akira Toriyama, to whom we all immediately think Dragon Ball Z or Chrono Trigger. The voice acting is pretty cheesy at times, but all the characters have great personalities. You’ll quickly attach yourself to certain characters, and I personally included my favorites from DQVIII as much as possible. Dragon Quest Heroes is a solid game. I highly recommend for fans of either Dynasty Warriors or Dragon Quest. If you like beat em’ ups with some strategy, then why not try it? 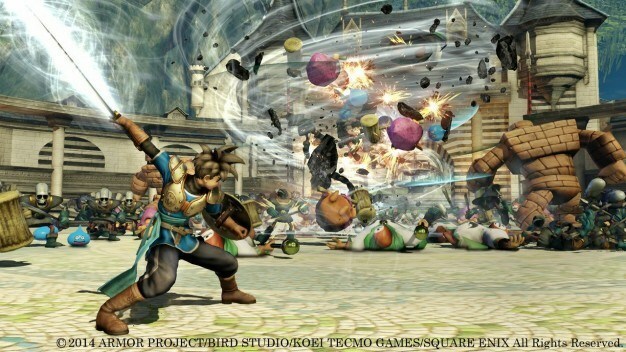 I know that Dragon Quest Heroes 2 is currently in the works, so it will be exciting to see what the sequel has to offer as well.